That’s why, when I changed my thinking somewhat and began writing a simple list of “Three Good Things” that happened every day, it was much easier for me to recount the many, many small things that happen and add up to a happy life. The weather was perfect today – add it to the list. You had a good day at work – write it down. Unfortunately, every so often you wrack your brain for three good things at the end of the day and all you can add to the list is, “I’m glad this day is over.” That’s OK, too. I find it relaxing and uplifting to write this list right before I go to sleep at night. It’s a positive way to end your day and it’s great to scroll back through the day to remember and note the things that went right. Do you keep a gratitude journal? What types of entries do you make? 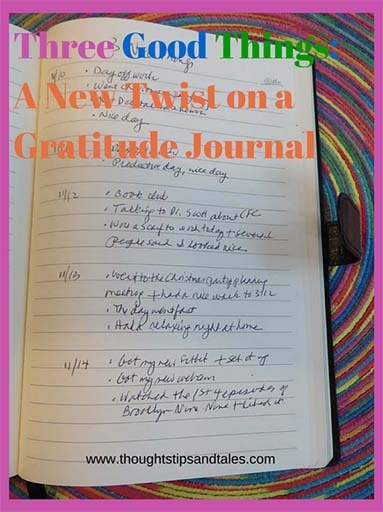 This entry was posted in expressing gratitude, gratitude, gratitude journal, journaling, life, memories, miscellaneous, stress relievers, three good things, victory log and tagged blessings, gratitude, gratitude journal, journaling, life, memories, thoughts tips and tales, three good things a day. Bookmark the permalink. Enjoyed your ideas on how to journal Three Good Things Daily and the great prompt suggestions!